A 2016 study found that yoga nidra helped employees manage stress in the workplace. The study suggests that the process of yoga nidra accesses the parasympathetic response and decreases the sympathetic nervous system response which results in more physical, mental and emotional relaxation in our bodies. In other words less anxiety. In our day to day lives, we have many responsibilities. As good people we try to keep on top of our to do lists. We become human doings rather than human beings, trying to control the endless commitments of our lives. We keep going, afraid to get off the hamster wheel of accomplishment. We become exhausted by our obligations. This constant, highly stressed state triggers anxiety. 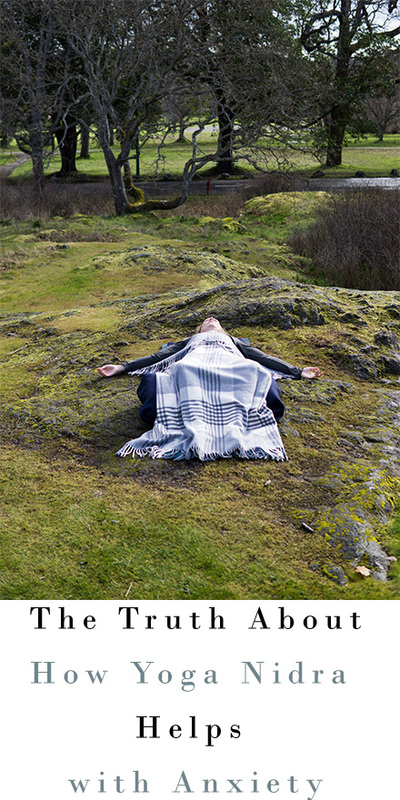 Enter yoga nidra. During the practice of yoga nidra the body is systematically relaxed. Your muscles relax, your heart rate slows down and your breath deepens. Not only are stress hormones are actually removed from your body, but your body also releases hormones that help with anxiety including GABA, (which is incredibly calming to your body), serotonin and melatonin. Now, if you head on over to my friend Silke Dewulfe’s channel she we personally fill you in on how minimalism helps her to deal with anxiety. You know how much I love my fabulous finishers, so if you made it all the way to the end of this video put, “GABA calms my body and mind” in the comments.